So you can bake delicious cakes, you can also make delectable frosting, maybe pipe a message on that cake, and even throw the odd fondant cutout… so you can create a cake with a few decorations. But when it comes to creating an impressive party cake, you feel you can’t! After all, you think: I am not a cake decorator. Well it could be true, not everyone is a talented and skillful cake decorator. But if you still want to decorate an impressive themed cake, who says you can’t? Only you do! 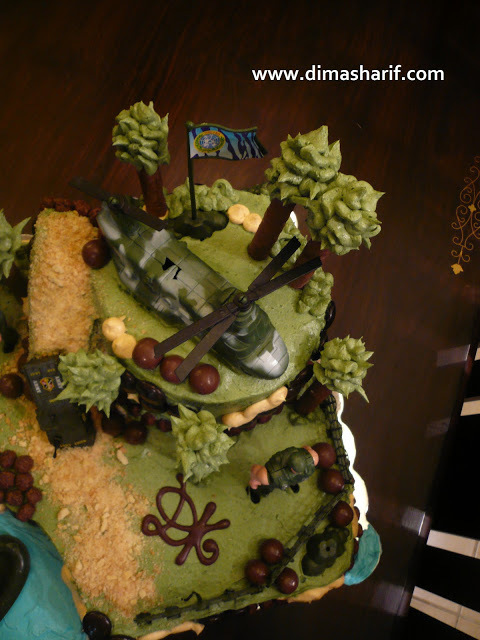 I am using this Army Themed Cake as an example, but these tips apply to any theme you want to carry out. Let your imagination be your guide. Bake a cake and make the frosting – Try this Victoria Sandwich Cake I had posted, and use it as base. Or check the end of this post for cake recipe links and choose a cake to bake. Buttercream is the best frosting for a cake, here is the link to the recipe. Buttercream can be used to pipe details or messages, frost as well as fill cakes. You can go for jams, chocolate spreads, peanut butter and jelly…etc for fillings. Be creative and think of the overall flavour. Completely cool your cakes before you attempt to frost and decorate them. Always go for at least 2 layers of cake sandwiching a filling – Fill the cooled cake, top with the second layer, then crumb coat. Leave in the fridge to firm. Your cake is now ready to decorate. Have a theme in mind – This will help you determine everything you need to do. From the colours, to shapes and anything you will need to create that theme. For instance, an army theme includes: camouflage, soldiers, aircraft, army tanks, flags, bombs, and a field for battle. While you cannot incorporate everything that army stands for, you can choose enough elements to let everyone know this is an army cake. Choose items that you can make or find ready-made to incorporate in the decoration. Create a list of items that you need to carry out the theme – Make sure to have everything you need readily available. If the cake includes trees for example, how are you going to make those trees? What can you use to create the trunk? & what for leaves? Will you need skewers to hold it in place, or is your trunk solid and does not need support? Make a list of all that you are using and get everything ready. It helps if you can draw the cake on paper and see how it looks like. Now I am not referring to Picasso style drawing, just a simple drawing to help you visualise the cake. You can even use clippings of items you are using. Play around with their positioning before you go ahead and place decorations on the cake. This way you will get a fuller picture and won’t mess up the design when you are still not determined on the final look. Always bear in mind that less is more – do not over crowd the cake with many types of things that you cannot tell what is what anymore. Even when you do fill it up, make sure all additions make sense to the theme and overall look. Decorators usually create everything from scratch and shape their designs using sugar-based clay. While this could require know-how and specific skills, you can utilise many confections readily available in the supermarket to help you carry out the theme. Edible round shapes – are perfect to use as stones, rocks, camouflage or even bombs (as in the picture above)…etc. These can be chocolate balls, chocolate buttons, cereal coco pops, or cereal rainbow pops, jelly beans, smarties or M&M’s…etc. The small colourful pieces of these such as smarties or mini M&M’s can be used to decorate Christmas trees or fill bowls of fruits or create mosaics…etc. Chocolate Cigarillos or sticks – are perfect to use as tree trunks (as in the picture above), pipes, building pillars, wood logs…etc. Brown Sugar – is the best to use for a sand effect. Nothing creates better sand than brown sugar. If you are looking for more texture to your terrain (see picture above) you can use cake crumbs and crushed cookies or wafers. Coloured Piping Gel – is the best water effect. For making pools, sea, or bath tub…etc. If spread very thin, it will be a good impression for stained glass too. Piping gel is nowadays found in almost all supermarkets. It is a jelly like spread that is colourless. You can tint piping gel with food colours then use it for water or glass. Piping gel is also a good base to adhere pieces on a fondant covered cake. Candies and Jellies – all these confections can be used to help you carry out the theme. Gummy snakes are perfect for a forest or jungle theme, Gummy strawberries, bananas, oranges and cherries are excellent for a fruit bowl or basket…etc. Marshmallows, mini crackers, wafers, chocolate blocks…etc . are all things you can use. Let your imagination guide you and use a variety of confections to express the theme. Ready Fondant or marzipan – these will help you make small figurines (exactly as you would from play dough). You can use marzipan or fondant to make small tanks, rocks, small cars, ipods, fruits, vegetables, animals…etc. Decorator’s must create edible design elements. They will carve, sculpt, mould and do all it takes to create all -edible figurines and design items. While it is always best to go for 100% edible decorations, this is your cake and you really don’t have to. Your characters can be small toys, you can add some non-edible decorations provided they are clean and large enough to see that people don’t choke on them. You must declare these are not edible, and also have to remove all non-edible pieces from the cake before slicing and serving. The men, helicopter, flag and fence are all non-edible. They have helped create the theme, and made the cake pretty. They were all removed before slicing and serving, and given to the birthday boy as a keepsake from his birthday cake. A bonus I would say! Since you have made butter cream for frosting, make sure to make lots of it. 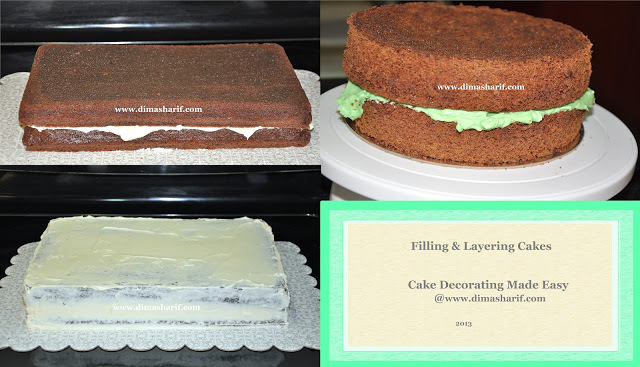 Once you have crumb coated the cake with the first thin layer of frosting, then you are going to cover the cake with another good layer of frosting. You don’t even have to cover the cake with fondant, although if you want to, here is a link for the tutorial. Once the cake is properly frosted, you can add the decorative confections then use the remaining buttercream to pipe details, such as the tree leaves and the sea water (as in the picture above). Then add the rest of the pieces and pipe a message on the cake. Have a delicious, beautiful and stress-free cake decorating time! Very informative. It took me about 8 hours to try to make the frosting smooth for my first cake that I was making for a friend's baby shower. wish I had known some of these tips.